Club Clio Philippines Club Day Weekend December 16 - 17 | Top Beauty Blog in the Philippines covering Makeup Reviews, Swatches, Skincare and More! K-beauty fanatics and beauty junkies rejoice! 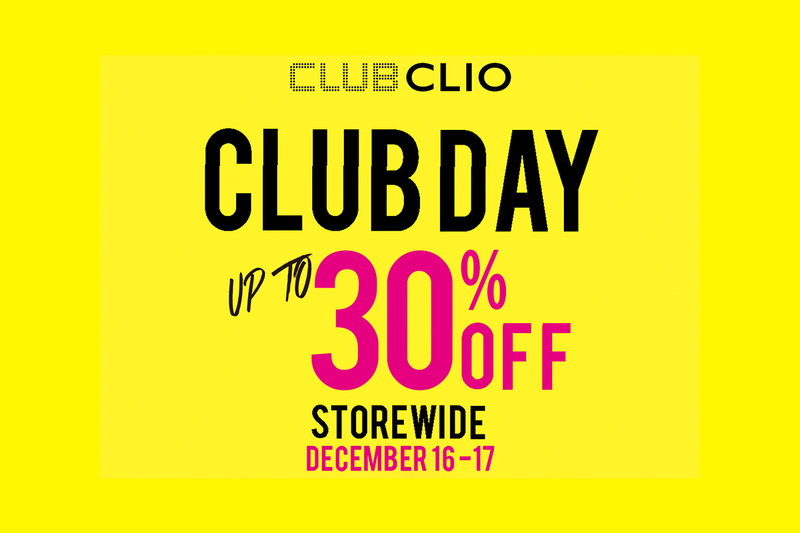 Due to insistent public demand, Club Clio's biggest sale is back not just for one but 2 days on December 16- 17. Shop for your Clio, Peripera and Goodal favorites for as low as 30% off because they're treating everyone to a weekend of amazing deals at Club Clio Trinoma, Festival Mall, Lucky Chinatown, SM Fairview, SM North Edsa, Robinsons Galleria and Uptown Katipunan Pop-up. Club Day is an exclusive sale day for Club Clio. It is their way to give thanks to their loyal fans and treat them to a day full of amazing deals, steals and makeovers to help unleash the K-beauty addict in all of us. Club Day will be held at Club Clio's Trinoma, Festival Mall and Lucky Chinatown branch on November 25, 2017 (Saturday) for the whole day. You may register at http://bit.ly/ClubDayPriorityList for priority access to this sale event. Follow Club Clio on Facebook and Instagram for more info!